President Donald Trump just said he wants America to have a “space force” charged with protecting America in, well, space. The problem is that it’s unclear he will actually get one. On Monday, Trump signed an executive order meant to create the space force, which would be the sixth branch of the US military (but the White House text of the order doesn’t feature a directive to create the space force). He then asked Marine Gen. Joseph Dunford, the chairman of the Joint Chiefs of Staff, to oversee the creation of the new service. Trump has long called for te creation of a space force, saying in March that it would be “like the Army and the Navy, but for space, because we’re spending a lot of money on space.” There was even a congressional push last year that tried to formally create the new service. But Congress flatly rejected that proposal. In this fiscal year’s must-pass defense budget bill, both the House and the Senate decided against a new space force, preferring instead to keep space defense within the Air Force. That doesn’t seem to matter to Trump, since he has now ordered the creation of the space-focused service. It’s unclear whether Trump can actually create a military branch out of thin air. But one thing is for sure: He doesn’t have much support for it. Even Secretary of Defense Jim Mattis came out against it. “I oppose the creation of a new military service and additional organizational layers at a time when we are focused on reducing overhead and integrating joint warfighting efforts,” Mattis wrote in a letter to congressional defense leaders last October. Of course, there’s nothing stopping Trump from wanting a space force or even ordering its establishment. It’s just an open question as to whether there will ever be a space force. 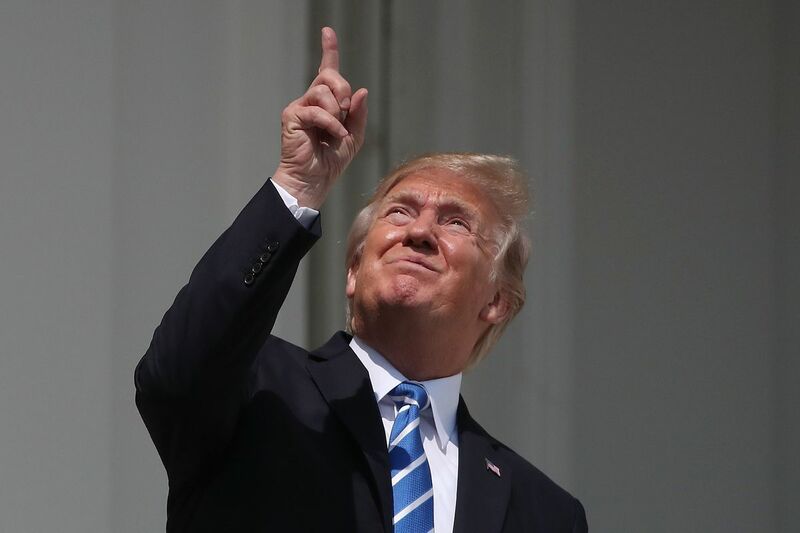 “[T]he near-term practical effect of all this is that the president can direct DoD to come up with a plan and start preparing to create a space force, but he still needs congress to authorize it,” Todd Harrison, a defense expert at the Center for Strategic and International Studies think tank, tweeted on Monday. There are two main reasons for that: Russia and China. According to the Defense Intelligence Agency, Russia wants to gain more power in space because it believes gaining supremacy there will allow it to win future fights on this planet. And in late 2015, China created the Strategic Support Force, which is meant to streamline and improve its space, cyber, and electronic warfare missions. The two countries are causing problems with anti-satellite technology, too, noted Director of National Intelligence Dan Coats in a Senate Intelligence Committee hearing last May — meaning they could mess with the satellites that help the US military do its job. The Pentagon is planning to open a space-war center to counter their threats. Okay, but … what sort of conflict is actually going on in space? What are we really talking about? Basically, there are tons of military equipment in space, especially satellites. This kind of equipment helps the US, Russia, and China — and any tech-savvy force — navigate terrain and communicate with one another. On top of that, assets in space help to track enemy fighters, take pictures for intelligence services, and even help control missiles. Without space, it would be much harder to fight on Earth; that’s why Russia and China are investing so heavily in it. But Russia and China aren’t space’s only threats. The area just outside Earth’s orbit has seen an explosion of commercial satellites and other communications equipment since the 1960s, put there first by countries and, as of late, by commercial companies. That equipment is used to help drivers reach their destination, help potential lovers swipe right on dating apps, or simply help people text friends. 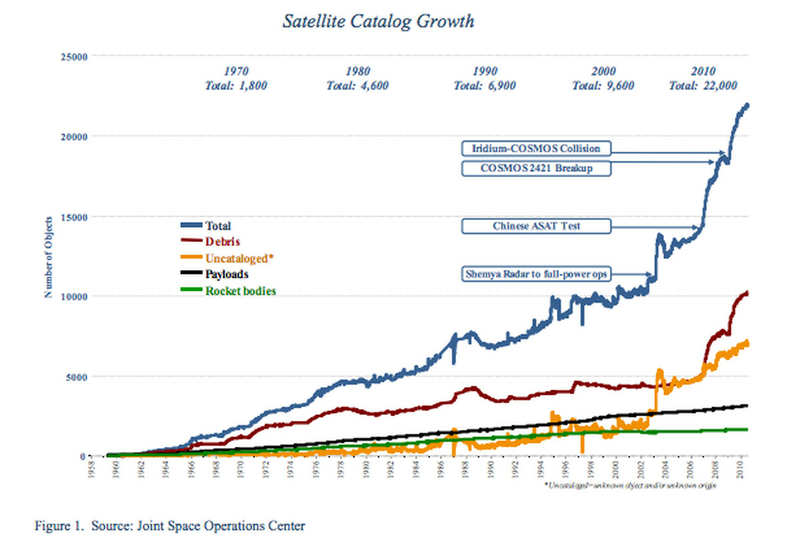 The chart below shows the huge growth in these satellites. The blue line represents their total growth since around 1960. The internet, of course, adds a new complication to all the equipment that countries are putting in space. Most notably, equipment can potentially be hacked. For instance, a team of hackers could jam a satellite by messing with its signals so it interrupts the satellite’s normal activity, rendering it useless. That could cause problems for all sorts of everyday activities, like credit card transactions and phone calls. Then, of course, there’s space debris threatening all of that commercial and military space equipment, since it could knock into the expensive machines. NASA estimates that there are 20,000 pieces of debris larger than a softball orbiting the Earth, about 500,000 pieces of debris the size of a marble or larger, and many millions of pieces that are too small to register. The idea is that creating a new service will ensure that there’s a segment of the military whose entire job is to focus on space 100 percent of the time. That would allow a space force to counter Russia, China, and other threats while giving space-focused staff more bureaucratic power inside the Pentagon. But Sean O’Keefe, a former NASA head and Navy secretary, thinks creating a brand new branch of the military is not the right way to go. “This is a solution in search of a problem,” he told me in an interview last summer. Basically, he thinks the Air Force is already doing a fine job protecting space, even if it does privilege earthbound pilots. Creating a space force would just add another layer of bureaucracy to an already massive organization: the Pentagon. James, the former Air Force secretary, agrees. She thinks dealing with the current complaints about the Air Force and space — 1) that it’s not well-funded, 2) that acquisition takes too long, and 3) that there is no one person to call about military space operations — makes more sense.